A friend of mine who also goes to a lot of events here in Atlanta said that I should really come and meet Jamie Ford. I decided to go and see Jamie Ford at the Margaret Mitchell House. The author is very kind and personable, and I highly recommend meeting him. He was on tour for his book Love and Other Consolation Prizes. The story begins with Ernest standing by his car watching the events of the 1962 World’s Fair in Seattle. His memories take him back to the 1909 World’s Fair in the very same location. His life changed that day, because he was the boy who was auctioned during the fair. The results were a permanent home for the first time since coming to this country. His daughter Juju has plans for a story for her paper, where she is employed. Juju wants to know her father’s story. It is what she does not know about the story and her origins that might change the story. Will she want to share it with the world, once Ernest shares his story? I liked this book. It is well written. I was not a fan of the setting, which is a brothel. I felt that the author handled the setting marvelously and it did not take away from the story. The story is told from Ernest’s point of view. Readers can easily follow Ernest’s experiences of his life. Also how the people he came in contact with shaped his character and how he wanted to be remembered. 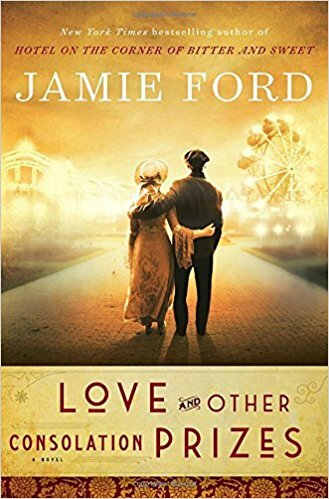 I really enjoyed Jamie Ford’s talent for storytelling. To purchase a copy of Love and Other Consolation Prizes here.